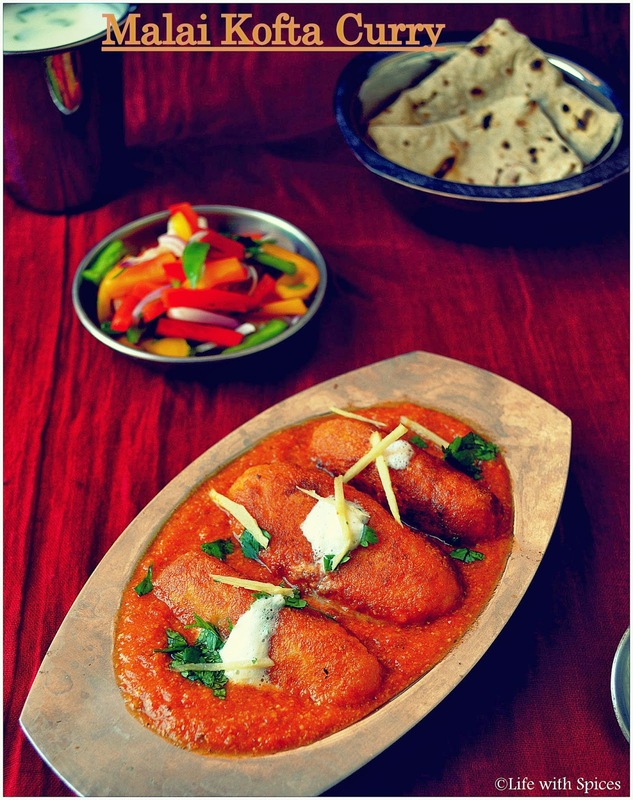 Malai Kofta Curry a must order at any Indian restaurant but the traditonal once are way too sweet and it never suits my taste buds. This recipe well suited to me and made few changes to make it less in calorie in take. It's a challenge provided by Nupur for this Month's South Vs North Challenge for South Team Members a event run by Divya Pramil. Made Phulkas my favorite as always to go along with this curry and also made bell peppers salad n spiced buttermilk for today's hearty lunch.. Mix all above roll into kofta shapes and shallow fry and drain them. Roast above all for 2 mins and blend into smooth paste. Heat oil in a pan add onion mixture fry well and add tomato puree cook till oil seperates. Add chilli powder, turmeric powder, garam masala n salt mix well and allow to cook. Now add 1/2 cup water bring to boil add Kasoori methi and simmer now add milk mix well simmer and add coriander and serve hot with Pulkas or any Indian bread.